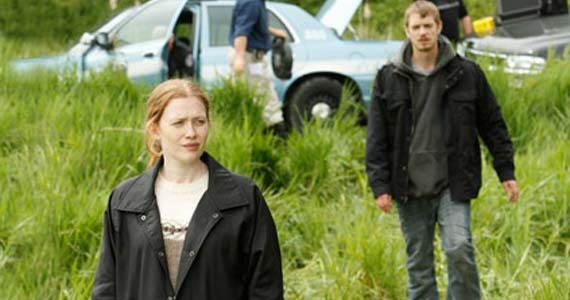 Sarah Linden (Mireille Enos) is the lead homicide detective investigating the murder of young Rosie Larsen. Although Linden was about to move to Sonoma, Calif., (a sunny change from perpetually rainy Seattle, where the show is set) with her fiance and son, her final case keeps her around, partnered with Stephen Holder (Joel Kinnaman), the detective who was supposed to take her place. This entry was posted in BP at the Daily, The Killing and tagged AMC, BP at the Daily, Brent Sexton, Michelle Forbes, Mireille Enos, Rosie Larsen, Seattle, Television, The Killing, TV. Bookmark the permalink.